Translation: A forbidden swimming pleasure. 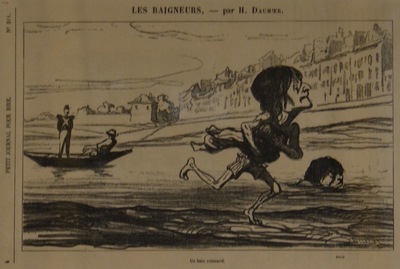 Notes: Series Title: LES BAIGNEURS, - par H. Daumier. Publication: LE JOURNAL AMUSANT, PETIT JOURNAL POUR RIRE 6.8.1864. LES BAIGNEURS, - par H. Daumier, a series of 10 unnumbered prints, which initially appeared in the JOURNAL AMUSANT between July 30 and August 20, 1864 using the system GILLOT, before being published in the PETIT JOURNAL POUR RIRE. TECHNICAL INFORMATION. This print has been produced following the system GILLOTAGE. ABOUT THIS PRINT. One of the "Bathing Boats", called "Petit, Ecole de Natation" was moored very close to Daumier's house at the Quai d'Anjou on the river Seine. Acquired as part of the James Smith Pierce Collection.